[S284] Index - New South Wales BDMs online, at http://www.bdm.nsw.gov.au, Birth Reg. No. 31834/1906. [S542] Index - New Zealand BDMs online, at http://www.bdmhistoricalrecords.dia.govt.nz/, Death Reg. No. 2002/22786 gives this birthdate. [S443] CD - NZ Marriages, CD - NZ Marriages 1836-1956 V2, NZ Registrar General's Folio 5581. [S542] Index - New Zealand BDMs online, at http://www.bdmhistoricalrecords.dia.govt.nz/, Marriage Reg. No. 1930/10474. [S542] Index - New Zealand BDMs online, at http://www.bdmhistoricalrecords.dia.govt.nz/, Death Reg. No. 1984/50255, aged 86. [S542] Index - New Zealand BDMs online, at http://www.bdmhistoricalrecords.dia.govt.nz/, Death Reg. No. 2002/22786, aged 96. His parents had both died by the time he applied to the London Missionary Society, and he gives little details other than that he came from Perth and in 1828 while "in apprenticeship in a drug shop" his mother had died and he met a friend who awakened his religious feelings. Between 1828 and 1834 he was variously at Perth, Glasgow, and Stirling, pursued some form of medical studies, and also had two seasons as a ship's surgeon on whalers before 1834, when he decided to apply for a missionary's role. His pastor at Stirling (Alex Marshall) advised him to write to the LMS and his original letter of application, addressed from Dr Beath's, Pont Street, Stirling on 16th May 1834, stated that "I have been through the curriculum of a medical education", but majored on his keenness to become a missionary. Alex Marshall, writing in support of his application on 16th June 1834, said "..he has been for some time a member of (my) Congregational church in Stirling, and before that a member of the church in Glasgow under Dr Wardlaw's pastoral care. He has gone through the usual course preparatory to medical practice, but his heart is set on the work of a missionary." On 20 June 1834, writing from Dr Monteath's, Princes Street, Perth, Alexander Macdonald himself wrote "I entered my 22nd year in April last," and goes on to say, of his profession "I have gone through my medical education preparatory to practice" (though he does not say where, or for how long). Of his education he said "I have not got a very liberal education. I have got the first principles of the Latin tongue, but I regret very much at not being well acquainted with the original language of scripture". On 29th July 1834, supplying a confirmatory letter from Glasgow, the pastor Ralph Wardlaw wrote confirming the "two seasons" of whale fishing, and continued "Mr Macdonald left Stirling on 17th last month (i.e. June 1834) and returned to Perth from whence he came. He is but little more than 20 years, his parents are dead, and he is at present living in Perth with some friends". Whether officially medically qualified or not, his application was swiftly progressed and he found himself sent for training at Turvey College for the rest of 1834. The principal, Richard Cecil, writing on 19th December 1834, said that "while his time (at Turvey) will not expire until 2nd January 1835....I don't know what amount of preparatory knowledge is expected at Homerton (the LMS training college in London) but I fear they would think him poorly finished....His recollections of Greek Grammar are but cloudy". Though apparently showing "quickness of comprehension"......."I do not imagine that he excels as a speaker". In letters to the LMS he describes how, due to his wife's declining health, they had taken ship to Sydney some time before April 1850. By July his wife's health was improving, but he felt they were unable to return to Samoa. By December he had accepted a Congregational post in Auckland, and his employment by the LMS ceased. [S10] Book - James Sibree, Register of LMS Missionaries, p36. Note that this does not provide sufficient information to identify his parents, or the actual birth date. [S482] Email - R Macdonald, email and other correspondence to D Ferguson, 12 Dec 2006 onwards, Extracted from Library of the School of Oriental and African Studies (part of the University of London) where the archives of the London Missionary Society are now held. [S612] GRO Scotland, birth/bapt record, District of Fortingall, OPR Births/baptisms, GRO 355/0A 0020 0257 FR631 giving a birth on 15 April, baptised 30 Mar 1814, parents Robert MACDONALD and Agnes McLAREN, OR District of Dull, OPR Births/baptisms, GRO 346/00 0050 0313 gives a baptism on 4 May 1814, parents Alexr. 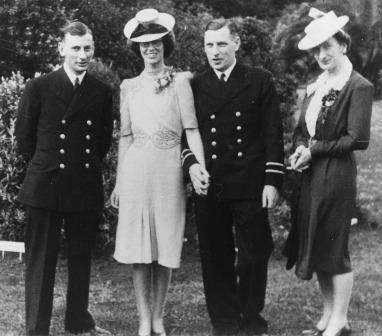 MACDONALD and Janet MACGILLIWIE. [S10] Book - James Sibree, Register of LMS Missionaries, p36. [S10] Book - James Sibree, Register of LMS Missionaries, Ordained as Deacon, see page 36. [S150] Book - Peter Green LLB, Norwich Archdeaconry Marriage Licence Bonds, Page 128. Entry shows: ANF/12/73/53 8 Oct 1835 MACDONALD Alexander, single, 21, Aldergate, London and BLOMFIELD, Selina, single, minor, Topcroft. 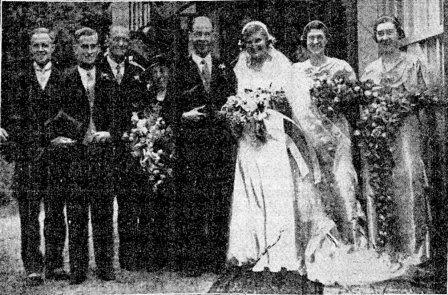 [S871] FamilySearch, at https://familysearch.org/, FHL film 1565275, batch I03854-9 (Topcroft, Norfolk parish registers, item 5, p21, Marriages 1813-1837). [S2] Book - Richard Lovett History of the LMS, sighted in Turnbull Library, Wellington, NZ, 12 Feb 1988. "He gave up medical practice in Scotland, and was sent by the London Missionary Society with Messrs Heath, Hardy, Mills, Murray, Barnden. Left Gravesend in Dunottar Castle 7/11/1835. Arrived Rarotonga May 1836 then Samoa in April 1837, settling at Safune in August. 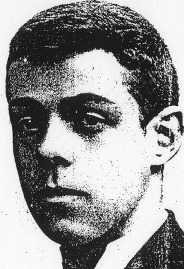 Later lived at Palauli. Left the Society in 1850 for New Zealand." [S747] Filmed Manuscript - National Library, Canberra, AJCP Microfilms: Film M30, box 15, folder 5, jacket C to film M75, box 4, folder 8, jacket A. [S747] Filmed Manuscript - National Library, Canberra, AJCP Microfilms: Film M30, box 15, folder 5, jacket C to film M75, box 4, folder 8, jacket A & Film M37, box 22, folder 4, jacket B to box 23, folder 5, jacket E.
[S338] Varcoe's NZ Marriage Index, at http://marvin.otago.ac.nz/marriages/, Folio 97. [S443] CD - NZ Marriages, CD - NZ Marriages 1836-1956 V2, NZ Registrar General's Folio 97. [S924] BDM Registrar of New Zealand, marriage record, Reg. No. 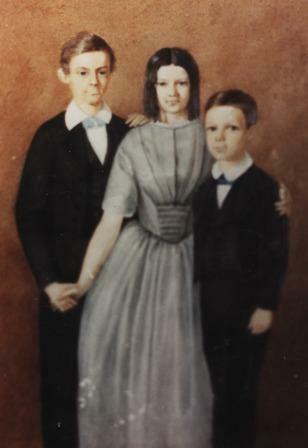 1857/497 (Eliza) and 566 (Frederick). [S802] Newspaper - Southern Cross, issue of 20 Mar 1857, Vol XIV, Issue 1015, p3. McDONALD - MATTHEWS - On 9th December 1859 at the residence of the bride's father, Wellesley-street, Auckland by the father of the bridegroom, Robert Conder, eldest son of Rev Alex McDonald to Emma, second daughter of Mr E J Matthews, Builder, late Clerk of Works, Royal Engineers Department. [S338] Varcoe's NZ Marriage Index, at http://marvin.otago.ac.nz/marriages/, Folio 130. [S443] CD - NZ Marriages, CD - NZ Marriages 1836-1956 V2, NZ Registrar General's Folio 130. [S924] BDM Registrar of New Zealand, marriage record, Reg. No. 1859/1150. [S265] Book - Edgar T. Jones, George & Martha Clarke Family Tree, p17. [S923] BDM Registrar of New Zealand, death record, Old folio 519, Ref. No. 30293072. [S910] Newspaper - Auckland Weekly News, issue of 1 May 1880, p8, Obituary. [S542] Index - New Zealand BDMs online, at http://www.bdmhistoricalrecords.dia.govt.nz/, Death Reg. No. 1880/406, aged 65. [S356] Will - Alexander Macdonald, Archives of New Zealand, Auckland Regional Office BBAE 1569 288. [S800] National Archives - NZ Archives (Archway), Auckland probate record, Item ID R21449790, Agency BBAE, Accession A48, box 11, record 288. [S923] BDM Registrar of New Zealand, death record, Old folio 515/1888, Ref. No. 1211292077. [S863] Newspaper - New Zealand Herald, issue of 13 Mar 1888, Vol XXV, issue 9000, p4 and 26 Mar 1888, Vol XXV, issue 9011, p9, Obituary, and also another obituary in a newspaper cutting pasted into "Henry's Bible" then in the possession of Miss A.H.M. Spencer, Mt Eden, Auckland, NZ. [S542] Index - New Zealand BDMs online, at http://www.bdmhistoricalrecords.dia.govt.nz/, Death Reg. No. 1888/1868, aged 75. [S801] Newspaper - Auckland Star, issue of 13 Mar 1888, Vol XIX, Issue 51, p8. [S139] Cemetery Entry - NZSG, Symonds St Cemetery, NZ Cemetery Records, Presbyterian section, west side, Section B03.17 (Vol 1, p49). [S395] Family Bible - Robert Macdonald bible. [S542] Index - New Zealand BDMs online, at http://www.bdmhistoricalrecords.dia.govt.nz/, Birth Reg. No. 1869/5683. 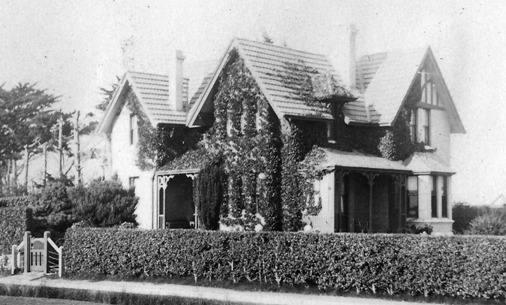 [S354] Electronic Files - A Macdonald, and subsequent correspondence, when Wilhelmina married, she was living at 12 Womerah Avenue, Sydney. [S284] Index - New South Wales BDMs online, at http://www.bdm.nsw.gov.au, Marriage Reg. No. 6688/1896. [S926] BDM NSW Registry, birth record, Reg. No. 4613/1899. [S716] NSW State Records, at http://www.records.nsw.gov.au/, Register of Firms - item 2/8526, p528. [S542] Index - New Zealand BDMs online, at http://www.bdmhistoricalrecords.dia.govt.nz/, Death Reg. No. 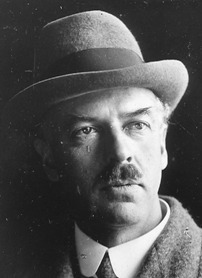 1921/10735, aged 49. [S542] Index - New Zealand BDMs online, at http://www.bdmhistoricalrecords.dia.govt.nz/, Death Reg. No. 1934/3111, aged 65. [S763] Hamilton City Cemeteries database, at http://www.hamilton.govt.nz/our-services/cemetery-services/…, Hamilton West, A3A-H-30. [S542] Index - New Zealand BDMs online, at http://www.bdmhistoricalrecords.dia.govt.nz/, Birth Reg. No. 1885/15115. [S355] Email - Mary (Macdonald) Khanna, email to D Ferguson, 3 Feb 2004, Details taken from Ian Macdonald's mother's address book during interview by M Khanna, Jan 2004. [S677] Index - England High Court of Justice, England & Wales National Probate Calendar, probate granted in London to The Chartered Bank. [S190] Index - GRO and Office of National Statistics, England & Wales Civil Registration Qtrly Indexes, Death: District of Maidstone, Vol 5b, p469. [S542] Index - New Zealand BDMs online, at http://www.bdmhistoricalrecords.dia.govt.nz/, Birth Reg. No. 1874/8036. [S703] Newspaper - Southland Times, obituary. [S708] NZ Electronic Text Centre - Cyclopedia of New Zealand, at http://www.nzetc.org, Otago & Southland Provincial Districts - Legal Section. [S443] CD - NZ Marriages, CD - NZ Marriages 1836-1956 V2, NZ Registrar General's Folio 1288. [S542] Index - New Zealand BDMs online, at http://www.bdmhistoricalrecords.dia.govt.nz/, Marriage Reg. No. 1902/1098. 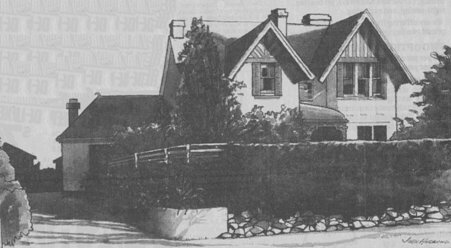 [S703] Newspaper - Southland Times, issue of 9 Sep 1978 (included drawing of the house in its current state by John Husband). [S595] Book - NZ Centre of Photography, NZ Pictorialists, Description published with a reproduction of the 'Road Workers' c.1928 225x265mm silver gelatine print (PSNZ collection). [S923] BDM Registrar of New Zealand, death record, Certified copy No. 99373. [S542] Index - New Zealand BDMs online, at http://www.bdmhistoricalrecords.dia.govt.nz/, Death Reg. No. 1937/24371, aged 63. [S586] Invercargill City Cemetery database, at http://www.icc.govt.nz/ServicesA-Z/Cemeteries/…, Block 9, plot 23. [S542] Index - New Zealand BDMs online, at http://www.bdmhistoricalrecords.dia.govt.nz/, Birth Reg. No. 1879/4050 (indexed only as 'Robert'). [S196] Commonwealth War Graves Commission, at http://www.cwgc.org, ARTHUR ROBERT MACDONALD, Second Lieutenant, 832070, 2nd Bn., Otago Regiment, N.Z.E.F. who died on Wednesday, 23rd January 1918. Cemetery: AEROPLANE CEMETERY, Ieper, West-Vlaanderen, Belgium; Grave Reference/Panel Number: VII. B. 39. 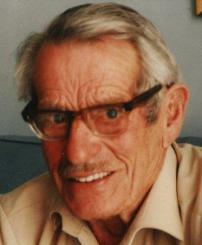 He was a reporter for the Southland Times, later the Otago Daily Times. He was also a fisherman while living at Half Moon Bay, Stewart Island. [S542] Index - New Zealand BDMs online, at http://www.bdmhistoricalrecords.dia.govt.nz/, Birth Reg. No. 1905/14178, and Death Reg. No. 1997/46400 gives this birthdate. [S443] CD - NZ Marriages, CD - NZ Marriages 1836-1956 V2, NZ Registrar General's Folio 7145. [S542] Index - New Zealand BDMs online, at http://www.bdmhistoricalrecords.dia.govt.nz/, Death Reg. No. 1985/51168. [S703] Newspaper - Southland Times, Deaths. [S542] Index - New Zealand BDMs online, at http://www.bdmhistoricalrecords.dia.govt.nz/, Death Reg. No. 1997/46400. [S750] Southland District Council Cemetery database, at http://www.southlanddc.govt.nz/my-southland/cemeteries-/…, Memorial Wall Row B, Plot 3. [S443] CD - NZ Marriages, CD - NZ Marriages 1836-1956 V2, NZ Registrar General's Folio 5112. [S926] BDM NSW Registry, birth record, Reg. No. 33644/1901. [S284] Index - New South Wales BDMs online, at http://www.bdm.nsw.gov.au, Death Reg. No. 55729/1974. 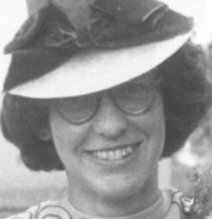 She had a lifetime affinity with all things mechanical (and later electrical) having been refused a Meccano set for her birthday as 'girls didn't play with things like that'. As a result she had to make do with borrowing her elder brother's sets. In later life you could always rely on the contents of her handbag including a small set of screwdrivers, which 'might come in handy' and frequently did. She followed her father's great interest in cars, but was not allowed to buy her first one (an Austin 7) until she had proven she could change the wheel of the family Dodge - a lot bigger and heavier job than the Austin! [S922] BDM Registrar of New Zealand, birth record, Reg. No. 1911/12476. [S443] CD - NZ Marriages, CD - NZ Marriages 1836-1956 V2, NZ Registrar General's Folio 9437. [S911] Newspaper - Christchurch Press, issue of 22 Oct 1934, issue 21301, Vol LXX, p3, col2-4, image, News for Women, A Christchurch Wedding. [S924] BDM Registrar of New Zealand, marriage record, District of Auckland, 1941, entry #76. [S703] Newspaper - Southland Times, issue of 27 Nov 1941, Marriages. [S443] CD - NZ Marriages, CD - NZ Marriages 1836-1956 V2, NZ Registrar General's Folio 10357. [S908] Newspaper - Nelson Evening Mail, Feb 1988, Deaths. 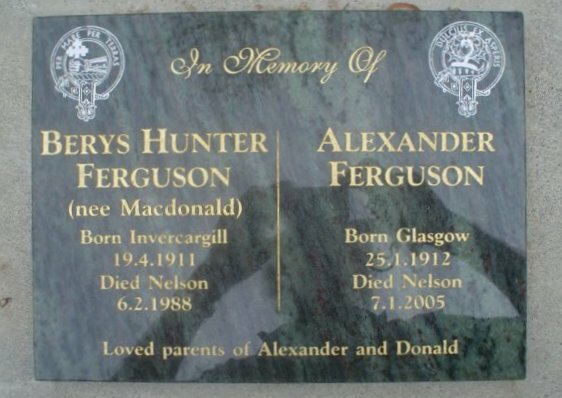 [S373] Cemetery Marker - Alexander and Berys H Macdonald, Marsden Valley Cemetery, Nelson, NZ. [S542] Index - New Zealand BDMs online, at http://www.bdmhistoricalrecords.dia.govt.nz/, Death Reg. No. 1988/38350.